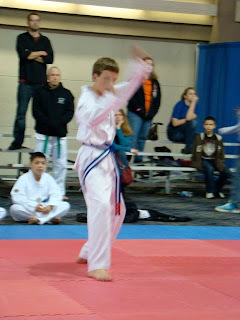 The weekend before Thanksgiving, we went to a tournament in Decatur, Illinois. There was fun to be had for all. Our hotel room was on the end of a row. On one side was the hallway. On the second side, were the elevators. On the third, there was a sort of landing with couches, and balconies. It was very difficult getting to sleep that first night. There were people running around, even playing hide-and-go-seek outside our room. We finally managed to get some rest, and boy were we glad! Saturday morning dawned bright and early with a crew that just couldn't sleep. We all got up and hit Cracker Barrel for a good breakfast. We knew eating would be hit and miss for the rest of the day. With five of us competing, plus wanting to watch all of our friends, it can make for a crazy, fun, exhilarating, tiring, and just plain great day. Youngling is the youngest competitor at our school. As a result, he is always the first to compete. He took second in forms. Next up was Professor X. He and Shady Rooster got some hang out time watching other people before he had to head back to the holding area (sounds like something they hold cows in, huh?). Look at that front stance, and snap. That's why he took 1st in forms. The Man Cub put in his best effort. Unfortunately, he did not get some pertinent information. As a result, his second match ended in him losing. He did not place in forms. Obligatory "Professor X has the camera" picture. The Shady Rooster took first place in forms, as well. 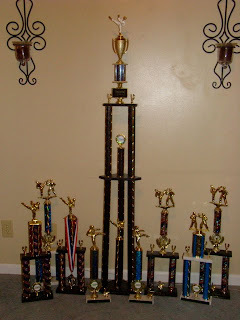 I took first in forms, and ended up with Grand Champion. Sadly, I had to compete against the Shady Rooster for that. Oh well. Maybe next time, Shady Rooster. After lunch, it was time for sparring. Only Professor X and Shady Rooster sparred. Poor Professor X. This was such a great learning experience for him. 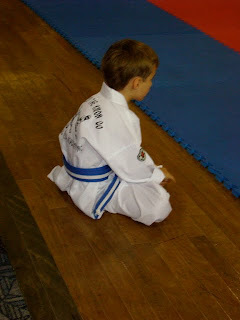 He came away with a 'pity' medal and a determination to learn enough to do better next time. Checking for loose teeth. Protect the head, dude! The Shady Rooster is seen here, fighting a Transformer! That's right, folks, the Transformers made an appearance at our tournament. Who knew they were real? There was another guy that had matching gloves and foot guards. I seriously was rolling in laughter. Sunday dawned too early, after a late night of food and fun with friends. Board breaking was on the slate, and we had to get ready. It was absolutely crazy. There were a lot of us competing, and not nearly enough board holders to go around. 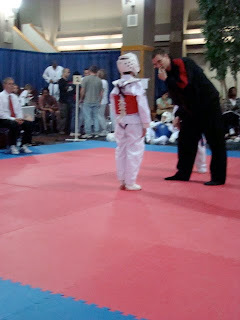 One of our black belts had to wait to do his competition, while another black belt did his. It was crazy and fast paced. I have no pictures of the Shady Rooster or myself. The Shady Rooster got silver, and I got gold. Man Cub got bronze. 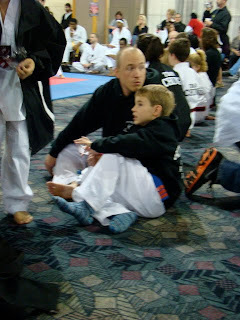 We were particularly proud of this one, since he had 14 kids in his division, and his division is a tough one. In all, we took home 5 1st place trophies, a second place medal, 2 send place trophies, 2 third place trophies, and a Grand Champion trophy. It was a good weekend.